Presenting to your boss or other colleagues can be a terrifying experience for many people. In fact, 3 out of 4 people have the fear of public speaking. It is normal, but it is a fear that can be confronted and well managed. Improving your presentations skills allow you to become noticed as an employee and more likely to take on leadership roles in your company. Check out following Infographic for more information on why it is important to improve your presentation skills in personal life and professional life. If you are like the other 75% of the working force, you too might want to learn the skills to improve your presentation skills. Check out these useful tips and techniques to help overcome your fear and give presentations at your company. Whether your audience is your boss, coworkers, or clients, it is important to understand them. What do they like or dislike? Do they have any special needs? By asking yourself these questions, you can design a presentation that will cater to them and that will be more memorable in the end. A lack of preparation is often noticed during a presentation. Make sure you know you know your topic well and practice giving the presentation. You do not want to stumble over words or be constantly looking at your notes. To help with your fear, you might want to give your presentation to family or friends so that they can give you some feedback. You need to be comfortable and at ease with the information, and it will give your audience the presentation that you are the authoritative source for the topic. It is also wise to prepare for any possible questions that the audience might ask. You can show your audience that you care a few ways. First, you should dress professionally and be clean. Your appearance can say a lot about how much you care about what you are presenting and your company. Another way to show you care is to show enthusiasm and heart in your presentation. By doing this, you will give your audience a sense of confidence in what you are saying. Your audience will only pay attention for so long, it is important to make sure that you grab their attention. You can keep your audience more interested by giving astounding statistics, anecdotes, and great visuals. Your Audience is more likely to remember your presentation if you keep them engaged. Give them handouts with the key points, statistics, visuals, etc. You can also get them engaged by asking questions and asking for feedback. At the end of your presentation, it is also important to have a Q&A session. 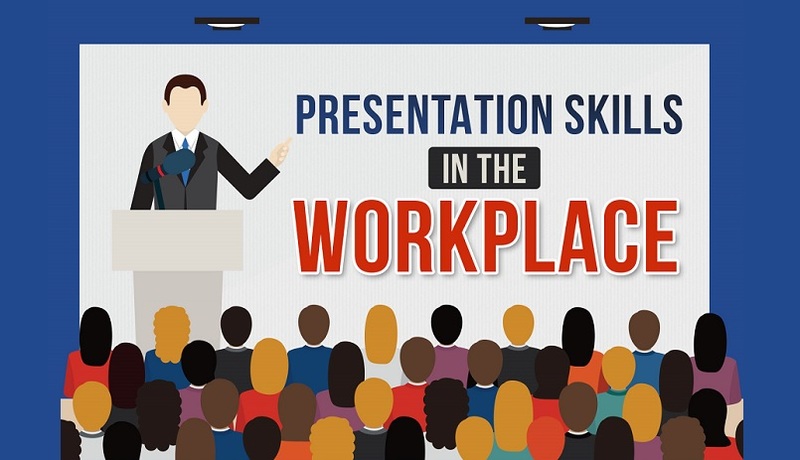 To further understand the techniques of presentation skills improvement in the workplace, you can check out the below visual content developed by "Presentation Training Institute".